Typhoid Fever; Travel; Ciprofloxacin; Ceftriaxone; Salmonella typhi. In Qatar, no epidemiologic data on typhoid fever have been available. We conducted this study to describe the epidemiological and clinical features of typhoid fever in Qatar and to determine Salmonella typhi antimicrobial susceptibility models as well as the outcome of typhoid fever treatment. We conducted a retrospective case series including all adult patients (≥ 15 years) diagnosed with typhoid fever who received treatment at Hamad General Hospital (HGH) and Alkhor Hospital, Qatar, between January 2005 and December 2012. HGH is a 603-bed tertiary care center that covers all specialties except hematology-oncology, cardiology, and obstetrics. Alkhor Hospital is a 115-bed general hospital providing healthcare services to the population in the northern region of Qatar. Both hospitals have been accredited by the Joint Commission International and Accreditation Council for Graduate Medical Education-International. A case was defined as symptoms compatible with typhoid fever and culture from blood (Bactec FX, BD BACTEC system, Franklin Lakes, NJ, USA), sterile site, or a stool sample yielding Salmonella typhi. Identification and antimicrobial susceptibility testing of organisms were performed using the Phoenix system (NMIC/ID-5 panel; BD Biosciences, Heidelberg, Germany) according to the manufacturer’s recommendations in the HGH microbiology laboratory. Serovar confirmation was done by serological agglutination using Salmonella poly- and monovalent antisera (Denka Seiken Co., Ltd. Tokyo, Japan). All cases were identified from the microbiology and infection control team records at HGH. This was followed by a retrospective chart review. Data retrieved for analysis included patient demographics, clinical characteristics, travel history, laboratory results, treatment, and outcome. The primary outcome was in-hospital mortality. This study was approved by the medical research committee at Hamad Medical Corporation. A waiver of informed consent was obtained from the research committee as the study only involved review of medical records. The data were analyzed using SPSS Statistics (IBM Corp. Released 2012. IBM SPSS Statistics for Windows, Version 21.0. Armonk, NY: IBM Corp.) using simple descriptive statistics. Figure 1: Month-to-month variation in typhoid fever infection between 2005 and 2012. Of the 354 patients enrolled in this study, 296 (83.6%) were males. Patients had a mean age of 28.4±9.3 years (range = 13–85 years). There were 42, 48, 39, 44, 46, 47, 52, and 36 cases of typhoid fever in 2005, 2006, 2007, 2008, 2009, 2010, 2011, and 2012, respectively. Overall, 343 (96.9%) patients had a history of travel to endemic areas. Among them, 93.0% acquired typhoid fever in the Indian subcontinent (India, Nepal, Bangladesh, Pakistan, and Sri Lanka). Table 1 describes the demographic data of all involved patients. 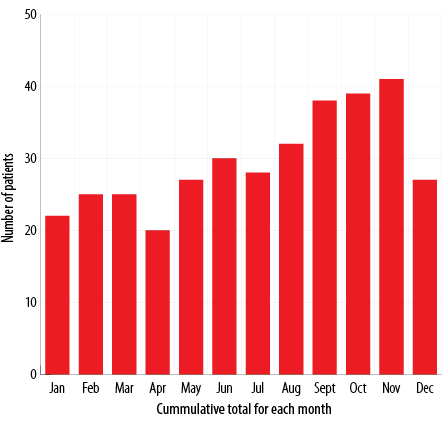 There was a month-to-month variety in infection occurrence. Peaks occurred between August and November [Figure 1]. Table 1: Demographic and clinical data of the 354 patients involved in this study. SD: standard deviation; DM: diabetes mellitus; HTN: hypertension; CKD: chronic kidney disease; CAD: coronary artery disease; HEV: hepatitis E virus; HBV: hepatitis B virus; CLD: chronic liver disease. Table 2: Clinical characteristics, treatment, and outcome of the 354 patients involved in this study. All patients received antibiotics. The mean duration of treatment was 12.8±3.0 days (range = 4–33 days). Ceftriaxone was given to 248 patients and ciprofloxacin to 51 patients. Two hundred and fifty (70.6%) patients were hospitalized for a mean duration of 13.8±4.8 days (range = 4–33 days). Many complications were reported in this study including pneumonia, acalculous cholecystitis, pancreatitis, and rhabdomyolysis. Four patients developed intestinal perforation, which was surgically repaired in two cases. Two patients (0.6%) died, one Qatari and one Bangladeshi. Table 2 describes the clinical characteristics, treatment, and outcome of patients involved in this study. In our study, Salmonella typhi, showed high resistance to ciprofloxacin (n = 163, 46.0%), and low resistance to ceftriaxone (n = 2; 0.6%). Table 3 summarizes the antimicrobial susceptibility of Salmonella typhi isolates. Table 3: Antimicrobial resistance rate of Salmonella typhi isolates. A total of 486 cases of typhoid fever were recorded in Qatar from 2005-2012, 354 cases were from HGH and Alkhor Hospital. To the best of our knowledge, this is the first report to describe typhoid fever among adults in Qatar. Our results are consistent with the age and clinical patterns of typhoid fever mentioned in other reports.4–9 However, some findings in this report deserve special attention as discussion of these issues will have a great implication on the control of typhoid fever in this country. In industrialized and high-income countries, typhoid fever is travel-related and is much more frequent in travelers to the Indian subcontinent than to other regions.1,5,6 Qatar is a high-income country, and it is non-endemic for typhoid fever but, due to increasing travel to and immigration from typhoid-endemic countries, typhoid fever has become quite common. As noted in our series, 96.9% of typhoid confirmed cases belong to imported cases, especially foreign workers, and 93.0% of our cases acquired typhoid fever in the Indian subcontinent. As imported cases assume greater importance in the epidemiology of typhoid fever in Qatar, reduction of infection can be achieved by education on food and water hygiene, and effective vaccination of travelers to typhoid-endemic countries. Although we do not have data on whether the patients reported here received information on food and water precautions and typhoid vaccination before traveling, we think most of them did not have pre-travel counseling. In light of these data, travelers returning from endemic areas with suspected typhoid fever should be treated empirically with antibiotics after obtaining appropriate cultures to reduce morbidity and mortality. Chloramphenicol had been the mainstay of treatment for typhoid fever from 1948 to 1980 when chloramphenicol-resistant typhoid fever cases were documented. Since then, many antibiotics had been used to treat typhoid fever, such as ampicillin, co-trimoxazole, ciprofloxacin, and third-generation cephalosporin.7–13 An increasing rate of decreased susceptibility to ampicillin, co-trimoxazole, and ciprofloxacin was observed in India and Vietnam between 1991 and 1999.5 Despite this, current reports from India showed increased susceptibility of Salmonella typhi to ampicillin, co-trimoxazole, and chloramphenicol.14 Similarly, our report showed good susceptibility of Salmonella typhi to ampicillin, co-trimoxazole, and ciprofloxacin, while ceftriaxone showed the least resistance pattern. Hence we advise starting ceftriaxone for all patients suspected of having typhoid fever until the results of culture sensitivity studies become available. Properly treated typhoid fever had a mortality rate of 0.5–1%.15,16 Two of our patients died in the hospital resulting in a mortality rate of 0.6%, which falls within the mentioned range. The first case was an elderly Qatari woman with comorbidities (coronary artery disease, ischemic cardiomyopathy, and diabetes mellitus); we think this woman died due to her comorbidities. The second case was a middle-aged Bangladeshi patient who worked as a laborer in Qatar, he presented late after two weeks of fever onset, with adult respiratory distress syndrome. Because of the retrospective nature of our study, we could not get more details to explain the reasons for his death. This study has the following limitations. First, its retrospective nature did not allow us to obtain additional details such as Salmonella typhi susceptibility to chloramphenicol, causes of death, and long-term follow-up of patients to report the number of carriers. Second, it was performed at two hospitals and the results may not apply to other hospitals. Third, we did not study other organisms that can cause enteric fever. Fourth, we included adult patients only and therefore, our findings might not apply to a pediatric population. Despite this, we believe that our findings represent a first step in knowing the epidemiology of typhoid fever in Qatar, which is of great value for healthcare policy-makers. Typhoid fever was frequent among immigrants to endemic areas. Thus travelers returning from endemic areas with suspected typhoid fever should be treated empirically with antibiotics after obtaining appropriate cultures to reduce morbidity and mortality. Early antibiotic therapy with a third-generation cephalosporin (ceftriaxone 2 g/day intravenously) is vital. Preventive measurements such as education on food and water hygiene, and effective vaccination of travelers should be practiced widely among travelers to endemic areas. 1. Ochiai RL, Acosta CJ, Danovaro-Holliday MC, Baiqing D, Bhattacharya SK, Agtini MD, et al; Domi Typhoid Study Group. A study of typhoid fever in five Asian countries: disease burden and implications for controls. Bull World Health Organ 2008 Apr;86(4):260-268. 2. Ni Y, Springer MJ, Guo J, Finger-Baker I, Wilson JP, Cobb RR, et al. Development of a synthetic Vi polysaccharide vaccine for typhoid fever. Vaccine 2017;35(51):7121-7126. 3. World Health Organization. Immunization, vaccines and biologicals. Typhoid. 2017 [cited 2017 November 24]. Available from: http://www.who.int/immunization/diseases/typhoid/en/. 4. Verma S, Thakur S, Kanga A, Singh G, Gupta P. Emerging Salmonella Paratyphi A enteric fever and changing trends in antimicrobial resistance pattern of salmonella in Shimla. Indian J Med Microbiol 2010 Jan-Mar;28(1):51-53. 5. Caumes E, Ehya N, Nguyen J, Bricaire F. Typhoid and paratyphoid fever: a 10-year retrospective study of 41 cases in a Parisian hospital. J Travel Med 2001 Nov-Dec;8(6):293-297. 6. Trojánek M, Dědičová D, Žemličková H, Jakubů V, Malíková E, Reisingerová M, et al. Enteric fever imported to the Czech Republic: epidemiology, clinical characteristics and antimicrobial susceptibility. Folia Microbiol (Praha) 2015 May;60(3):217-224. 7. Upadhyay R, Nadka MY, Muruganathan A, Tiwaskar M, Amarapurkar D, Banka NH, et al. API Recommendations for the Management of Typhoid Fever. J Assoc Physicians India 2015 Nov;63(11):77-96. 8. Kuijpers LMF, Phe T, Veng CH, Lim K, Ieng S, Kham C, et al. The clinical and microbiological characteristics of enteric fever in Cambodia, 2008-2015. PLoS Negl Trop Dis 2017 Sep 20;11(9):e0005964. 9. Ahmad Hatib NA, Chong CY, Thoon KC, Tee NW, Krishnamoorthy SS, Tan NW. Enteric fever in a tertiary paediatric hospital: a retrospective six-year review. Ann Acad Med Singapore 2016 Jul;45(7):297-302. 10. Vidyalakshmi K, Yashavanth R, Chakrapani M, Shrikala B, Bharathi B, Suchitra U, et al. Epidemiological shift, seasonal variation and antimicrobial susceptibility patterns among enteric fever pathogens in South India. Trop Doct 2008 Apr;38(2):89-91. 11. Vala S, Shah U, Ahmad SA, Scolnik D, Glatstein M. Resistance patterns of typhoid fever in children: a longitudinal community-based study. Am J Ther 2016 Sep-Oct;23(5):e1151-e1154. 12. Bhattacharya SS, Das U, Choudhury BK. Occurrence & antibiogram of Salmonella Typhi & S. Paratyphi A isolated from Rourkela, Orissa. Indian J Med Res 2011 Apr;133:431-433. 13. Jain S, Das Chugh T. Antimicrobial resistance among blood culture isolates of Salmonella enterica in New Delhi. J Infect Dev Ctries 2013 Nov;7(11):788-795. 14. Kumar Y, Sharma A, Mani KR. Re-emergence of susceptibility to conventionally used drugs among strains of Salmonella Typhi in central west India. J Infect Dev Ctries 2011 Mar;5(3):227-230. 15. Crump JA, Luby SP, Mintz ED. The global burden of typhoid fever. Bull World Health Organ 2004 May;82(5):346-353. 16. Buckle GC, Walker CL, Black RE. Typhoid fever and paratyphoid fever: Systematic review to estimate global morbidity and mortality for 2010. J Glob Health 2012 Jun;2(1):010401.